On Oct. 24th, I attended the very first GPLO meeting in Paris. 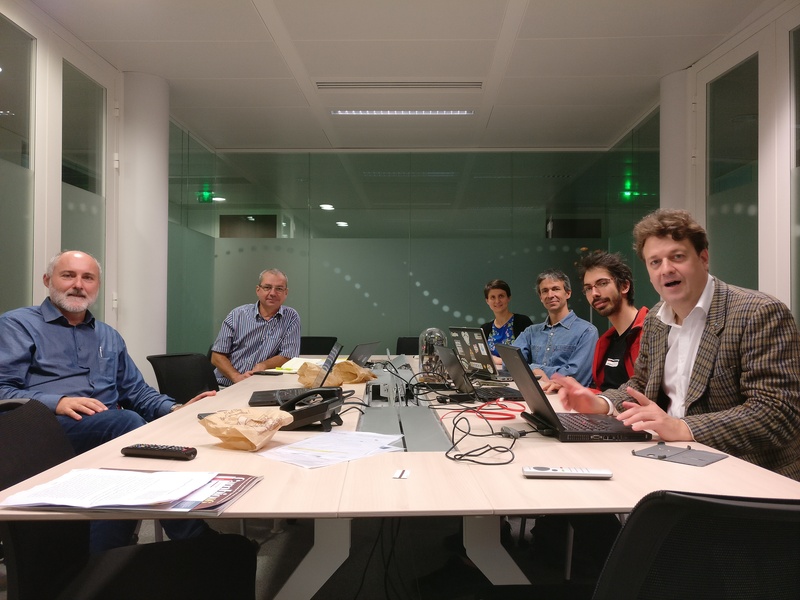 The "free and open software working group" (or GPLO for "Groupe Logiciels Libres et Ouverts") is part of the French Committee for Open science (CoSO). The goal of CoSO is to provide recommendations to the French Ministry of Higher Education, Research and Innovation on all aspects of opening the sciences. Members of the CoSO expressed their interest in taking part to this action after a call for participation sent in April this year. The committee is organized in four sub-groups: Academic Publishing; Research data; Europe and international partners; and Training. Additionally, 8 projects are currently undertaken by working groups, including the GPLO which focuses on scientific software. The mission of the GPLO is to provide guidance on software for open science and to reply to specific questions on an ad hoc basis. The first question was about evaluation of scientific software as part of the "open science monitor". The GPLO's answer, by Roberto Di Cosmo and François Pellegrini, is available here. licencing: how to pick licences for scientific software? Reconciling openness and value-creation. citation, indexing and archival of scientific software: how to take contributions to software into account for promotions? Reproducibility, documentation, long-term archival, etc. sustainability: existing models to recruit research software engineers, solutions for funding scientific software. Our next goal will be to define a roadmap for the coming months. We will then invite experts to share their opinions; and write up synthesis of current practices with recommendations. Are you interested in academic software? Please stay tuned for more information soon on how to get involved. Roberto Di Cosmo, Patrick Moreau, myself, Nicolas Thiéry, Gabriel Scherer, François Pellegrini, missing members from this picture: Mélanie Clément-Fontaine, Thierry Legou, Patricia Mirabile. 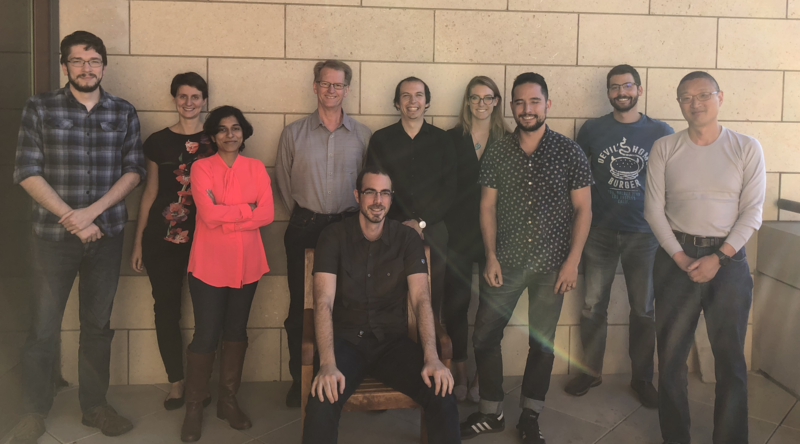 This week (Oct 17-19th), I attended the BIDS-Stats-Models meeting in Stanford, a collaborative workshop devoted to the extension of the 'Brain Imaging Data Structure' (BIDS) to statistical models. BIDS defines a folder structure to organize brain images. Since its creation in 2015, many tools and databases have adopted this standard making it easier to exchange datasets within and between labs. Beyond the original specification –which covered anatomical, functional and diffusion MRI–, extensions are underway for PET, MEG, Arterial Spin Labeling and more. BIDS covers basics metadata for functional MRI data (fMRI) which makes it possible to build automatic pipelines for preprocessing (e.g. fmriprep). But, to date, there is no support to describe the necessary pieces for fMRI statistical analyses. The BIDS-Stats-Models extension aims at adding this support. The goal of this meeting was to solidify the current draft of the BIDS-Stats-Models proposal. Here is a brief overview of what happened. Collaborative writing of a paper outline fleshing out motivations, relation with other tools and use cases. A review of what was accomplished and plans for future steps are at: https://github.com/bids-standard/bids-specification/issues/60. Interested in this effort? Please consider adding your own contributions: https://bids.neuroimaging.io! I'd like to thank Franklin Feingold, Chris Gorgolewski, Tal Yarkoni and Russ Poldrack for this great meeting. The event was covered on Twitter with #bidsstatmodels. 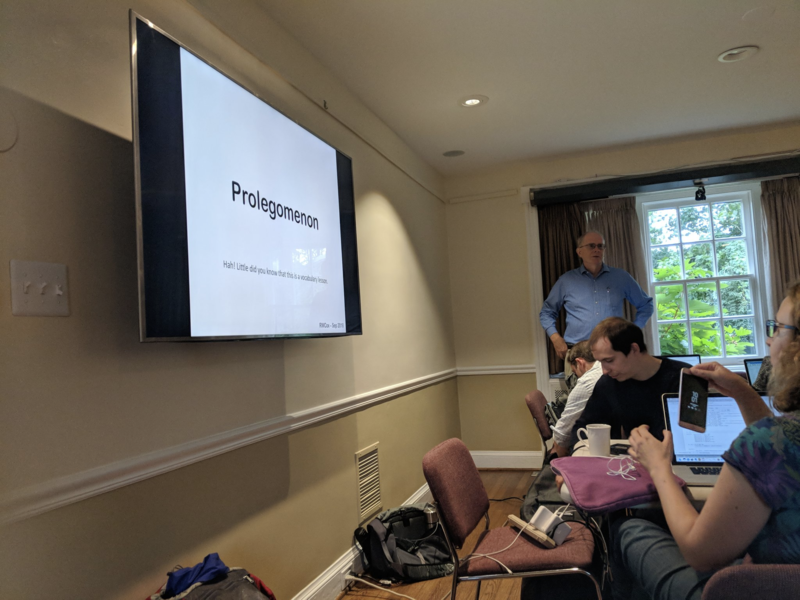 Last week (Sept 10-14), I attended Code convergence in Washington DC, a 5-day hackathon organized by the NIH in collaboration with the AFNI team. Twenty brain imaging researchers and members of the NIH worked collaboratively on improving AFNI and building bridges with other tools. We had a very productive week! The projects included: an automated testing framework for AFNI | creating machine-readable documentation and interfaces for AFNI through Boutiques | improving support for multi-echo EPI denoising with tedana | NIDM in JSON-LD | and three BIDS projects: understanding modelling of affine matrices in AFNI | refining BIDS model specification in anticipation of AFNI integration | drafting BIDS common transform file format. I led the NIDM export in AFNI project, to convert AFNI fMRI results into NIDM-compliant archives (or "NIDM packs"). NIDM-Results standardises how fMRI results are represented across neuroimaging software packages. With the NIDASH team, we have developed NIDM exporters for SPM and FSL. As one of the most popular software for fMRI analysis, AFNI was a natural next target. During this code convergence, I had the chance to work with Rick Reynolds and Justin Rajendra and to get feedback from Gang Chen, three AFNI experts. By the end of the week, we had a first prototype to export an example analysis and upload the resulting NIDM archive to NeuroVault. Future work, will include better integration with AFNI tool, such as leveraging the metadata extracted by the ClustExp_StatParse.py routine that is developed by Justin. This week was also the opportunity to hear about other standardisation efforts such as HAWG, a standardised format for human brain atlases. Tweet: A JSON-based format for neuroimaging atlases 👉 HAWG. @jbpoline kicks off day 2 at #nihdccc ! I would like to thank Dylan Nielson, Adam Thomas, John Lee and Bob Cox for organising this code reunion as well as all the AFNI team! The event was covered with #nihdccc on twitter. From February to May, I had the pleasure to join again Mozilla Open Leaders, this time acting myself as a mentor! Mozilla open leaders is a 14-week online training on working open best practices with 1-1 mentorship for project leaders. Applications for round 6 are now open: https://foundation.mozilla.org/opportunity/mozilla-open-leaders/apply/! There is still time to submit your project before August 6th. I think I've learnt even more as a mentor that I did when I initially participated in the program as a trainee. I had the chance to work closely with two project leads: Manasvi Lalwani and Rick Lupton. Manasvi was building an online curriculum for makers while Rick's project was to open a library he had written to expose flow data as sankey diagrams. Mozilla also provided training for the mentors that I found especially useful! I'm copying below, an interview with Rick that we made just before the Global Sprint. This article was initially posted on Read. Write. Participate. You will also find over there an interview with Manasvi presenting her project. Rick Lupton (@ricklupton) is a research associate with the Use Less group at the University of Cambridge where he looks at how resources and materials are used throughout society. By understanding how resources are consumed, he wants to help us use less and reduce our impact on the environment. Rick was selected to join the current round of Mozilla Open Leaders with his project floWeaver, which creates visualizations for flow data. I interviewed Rick Lupton to learn more about floWeaver and how you can help at the Mozilla’s Global Sprint 2018. Many kinds of data can be thought of as “flows”: energy and materials moving through industry, money flowing through the economy, telephone lines moving between providers, voters moving between parties, even the target of tweets. Most of my research is concerned with actual physical flows of energy and carbon-intensive materials such as steel and cement, but floWeaver can be used to visualise anything that can be thought of as flowing from one place to another. Why is it useful to visualize flow data? 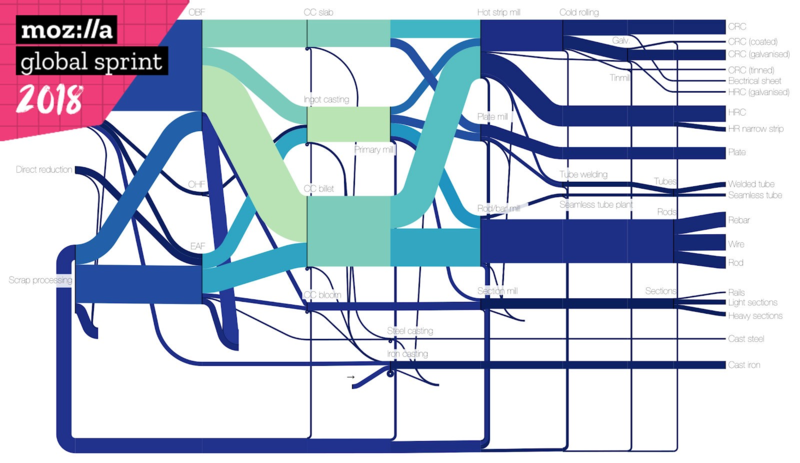 What is a Sankey diagram? A Sankey diagram is a kind of flow diagram with thick arrows, where the width of the arrow represents the magnitude of the flow. They have been used for over 100 years to identify inefficiencies and find opportunities to use resources more efficiently. I find them useful because they give a great overview of a system to show which potential changes are big enough to matter in the big picture. For example, this diagram shows global greenhouse gas emissions broken down to show which sectors they are associated with, the technical device that was involved, and so on. Why did you start floWeaver? In my research group we draw a lot of Sankey diagrams to visualise our work, so it made sense to build some tools to make this easier. It started with a research project working with a steelmaking company to understand how scrap could be avoided during manufacturing steel parts, such as car doors. When you cut out a steel part from a roll, you get offcuts round the edges, just like when you cut shapes out of cookie dough or pastry, and we wanted to find out how much of the offcuts could be reused to make smaller parts. To do this, the steel type, thickness, coating, and so on, have to be compatible, but we didn’t have any way of visualising these attributes within the context of the steel production chain. To solve this I developed what I called a “hybrid” Sankey diagram to show these details, and floWeaver grew out of that. What challenges have you faced working on this project? There are technical challenges, such as doing automatic graph layout of the diagrams, and calculation speed for large datasets. We’re defining a data format for exporting the initial automatic-layout Sankey diagrams into other tools for tweaking the layout, but keeping them all working together as the format has evolved is a nightmare. I’m looking forwards to when we’ve got a draft we’re happy with and everything will just work! As the leader of the project, there have been challenges in supporting more users as the project grows, and making sure to communicate effectively with and involve the wider range of people who could benefit from it, beyond my research group. The Mozilla Open Leaders programme has been very helpful in this process. What kind of skills do I need to help you? We are curating a gallery of examples of how people are using the project to all kinds of data — bring your own data and give it a go! Gathering feedback on what’s easy to use and what needs improving & documenting. Specifying a JSON-based open data format for interoperability between Sankey diagram tools, writing converter scripts and prototyping a web-based Sankey editor. Improving the graph layout algorithms and visualisation. Profiling and optimising the Python code to work faster on larger datasets. I did have “creating a logo for the project” on the list, but someone has kindly already volunteered to do that! How can others join your project at #mozsprint 2018? Have a look at the ”what shall I do? !” board for ideas, and see CONTRIBUTING.md on GitHub for more details. If you have any questions about how to join in please open a GitHub issue or ask on Gitter chat. I’m looking forward to taking part in my first Mozilla Global Sprint and seeing what comes out of it! June 14-21 were the OHBM hackathon and annual meeting in Singapore. I did not get the chance to attend in person and instead I've been following the conference on Twitter! Here are a few interesting things I spotted. Open science at OHBM is booming! 🎉 Last year, I was happy to see a better integration of open science activities in the main program. This year, it went one step up! The 3-day hackathon was very well attended with over 100 participants and an amazing organization. Throughout the meeting, and in multiple occasions, talks in the open science room attracted a packed audience. And the new "ice cream for open science" looked like a real success. OHBM 2018 young investigator award went to Daniel Margulies, who was one of the first to introduce the neuroimaging community to hackathons through Brainhacks with Cameron Craddock. At the PhD/Postdoc SIG mentoring symposium, Lucina Uddin discussed how to fail better and how failures are inevitably part of all successful academic careers. This is so important! A topic of personal interest for me, as a mother, it looks like more attendees were bringing their children to the congress. I know some conferences provide free childcare (e.g. RailsConf) and this must make the whole conference experience so much different! I am wondering if there anything we could do to make this happen at OHBM? Of course I've missed up on many things but following the event on Twitter has been much better than I anticipated! Thanks for everyone who tweeted using #OHBM2018. And I hope to see you all next year in Roma! Sprinting with bio-imagers and how I learnt about NEUBIAS, EuBI, Elixir and tried out myBinder! 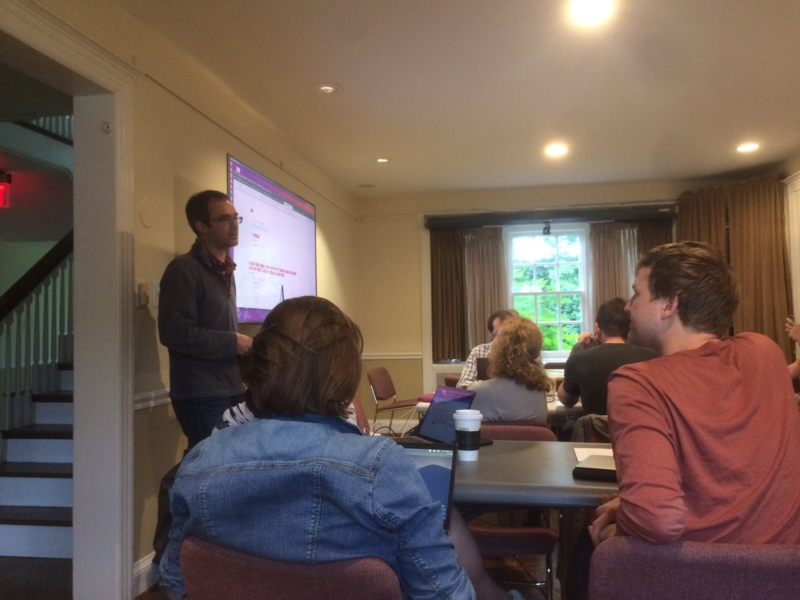 May 14-15, I was in Cambridge for a coding sprint jointly organized by bio- and medical- imaging infrastructures. The goal of the sprint was to capitalize on the infrastructure training experiences in order to provide online registries of training materials and create reproducible training environments. We were a group of about 20 software engineers and research scientists from bio-imaging (microscopy), medical imaging (MRI) and bioinformatics. Neubias: Network bridging developer / biologists / image analysts. Euro-Bioimaging (EuBI): European-wide research infrastructure for Imaging Technologies in Biological and Biomedical Sciences and their Global Bioimaging Project. Elixir: Infrastructure for life science informatics and their Tess registry of training resources. Then with my colleague Michael Kain we introduced France Life Imaging and their digital node IAM and shortly talked about the Brainhack community. In WG1, we started by representing various examples of training materials using the NEUBIAS model (as used in BISE). The following day, there was further effort to align this with Tess and bioschemas and to incorporate more examples directly in BISE. On the second day, I joined WG2. I was very happy to find out about myBinder! Give it a GitHub repository with a Jupyter notebook and it will turn it into an interactive notebook hosted online!. We used mybinder at: https://github.com/dwaithe/model-training and further focused on providing a Docker file that could be run locally to launch the course (https://github.com/ac744/model-training). I've also tested it on one of my own repository: Software_Comparison#3! I very much enjoyed meeting and working with members of the bioimage and bioinformatics communities! I'd like to thank the organizers Perrine Paul-Gilloteaux from University of Nantes and Gabriella Rustici from the University of Cambridge as well as FLI for support to attend the event. This event was covered using #trainhackcam on twitter. June 25th-30th, I attended OHBM 2017 in Vancouver. It has been a very rich and energizing meeting with open science activities being better and better integrated with the main meeting! The 5th OHBM hackathon has been a success and, this year, the program of the open science room was included in the official program booklet. "Neurohackers" were even featured in the closing highlights! Cluster Failure: Why fMRI Inferences for Spatial Extent Have Inflated False-Positive Rates: a follow up by Anders Eklund after his highly discussed paper investigating validity of clusterwise inference. Anders discussed follow up simulations he did in reply to some of the criticism to his paper. In particular, randomisation of events at the subject level. Overall the results hold. 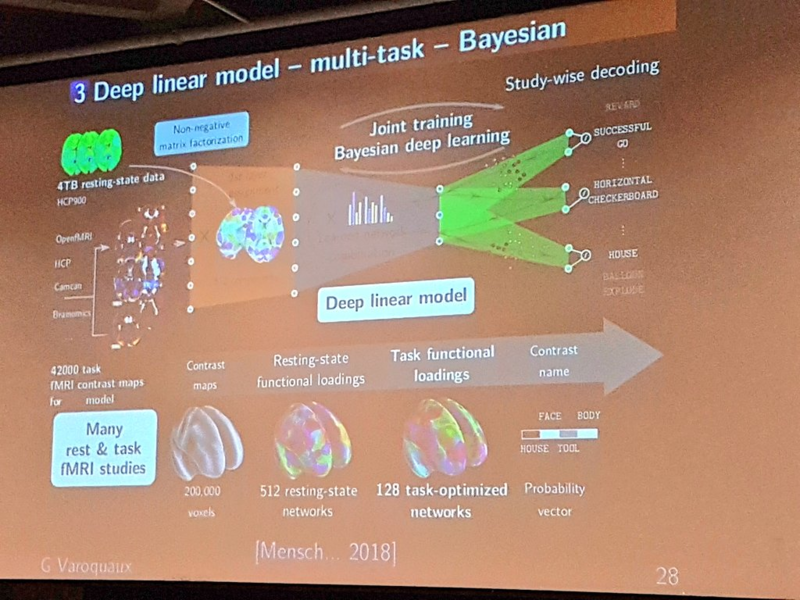 Keynote: Threat to valid fMRI inference (Tal Yarkoni): A great keynote packed with panda pictures to illustrate over-generalisation of the results. In particular, Tal presented joint work with Westfall and Nichols on treating stimuli as a random effects. Informatics session: Open Neuroimaging Lab presented by Katja Heuer for collaborative annotations and curation of anatomical neuroimaging data. Comparison of automated meta-analysis in Neurosynth with manually curated from BrainMap presented by Taylor Salo, OpenNeuro presented by Chris Gorgolewski: a new online plateform for data analysis (and data sharing), Mapping of cognitive function in the human cerebellum presented by Jorn Diedrichsen, Performance of Various Brain Atlases for Individual Identification using resting fMRI presented by Andrew Michael and the Brainnetome Atlas presented by Lingzhong Fan. Keynote: Revisiting Wernicke’s Area (Marsel Mesulam): A great keynote, discussing the role of Wenicke's region and how Wernicke's location has evolved through time. 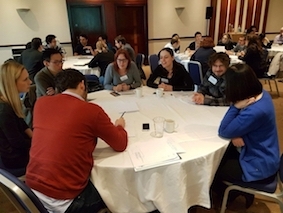 Mentorship: The brand new mentorship program organised by OHBM Student & Postdoc SIG also ran a session with career advice, including Mathew Abrams from INCF and Cameron Craddock on first grants. Demos (open science room): Many demos happened in the open science room throughout the congress, including: power tools for fMRI: neuropower by Joke Durnez and fmripower by Jeannette Mumford, BIDS presented by Cyril Pernet, NeuroVault by Chris Gorgolewski, Preprocessed Connectomes Project by Cameron Craddock and FMRIPREP by Oscar Esteban. See the #OHBM2017 on twitter and the OHBM blog for more discussions. From March to June, I participated in the 3rd round of the Open Leadership Training organised by Mozilla. This 12-week online training provides working open best practices as well as mentorship form the Mozilla community. I applied to join the 3rd cohort of open project leads in response to this call. This was a great experience and I would encourage everyone to apply for the next round! Applications for Open Leadership Training round 4 are now open! At the end of the program I was interviews by Abby Cabunoc Mayes, who is lead developer at Mozilla and runs the open leadership training. The interview is available on Medium and copied below. Camille (@cmaumet) is a Research Fellow at the Oxford Big Data Institute, focusing on open research and best statistical practices for meta-analyses. Camille was selected to join our current cohort of Mozilla Open Leaders for her work furthering open research practices and passion for open science. Earlier this month, Camille brought her project ‘Easy fMRI Reporting’, which she started when she was at the University of Warwick, to Mozilla’s Global Sprint (#mozsprint). 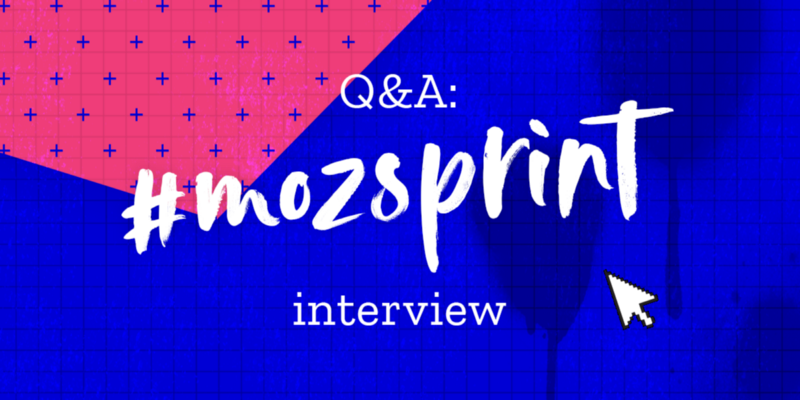 I interviewed Camille to learn more about her experience at #mozsprint, her project ‘Easy fMRI Reporting’ and how you can help. 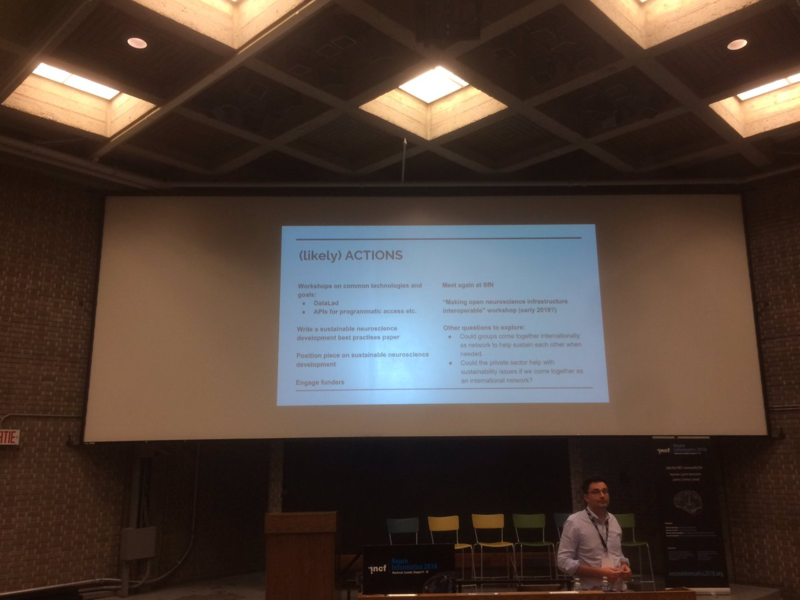 What is Easy fMRI Reporting? fMRI is an imaging method that provides information on how the brain works. One application is to try and understand which parts of the brain are active for a given task. For instance, I might ask you to move your right hand while you are lying in the MRI scanner in order to found out which part of your brain is responding while you are doing this simple task. Why did you start ‘Easy fMRI Reporting’? Scientific communities, and in particular the brain imaging community, are increasingly calling for more transparent research practices. But in practice complying with accepted best practices can prove difficult and time consuming. Fortunately a number of tools and standards are now available in the fMRI community to make our research more transparent! ‘Easy fMRI reporting’ describes current practical solutions to share data and code in support of the publication of an fMRI study and provides step-by-step recipes for different levels of data and code sharing. 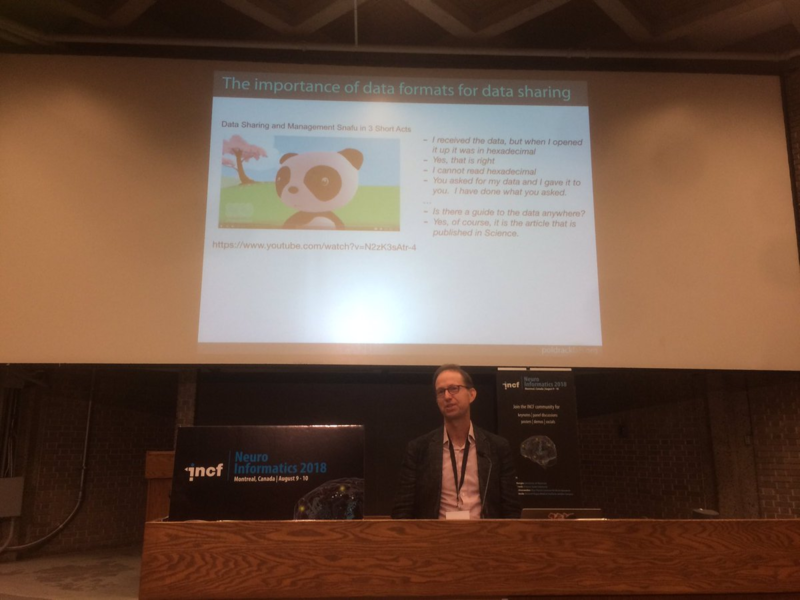 Why is data and code sharing important for fMRI studies? An fMRI acquisition generates a series of brain images and researcher have to apply a set of mathematical methods (or “pipeline”) in order to outline active brain regions. For example, an fMRI pipeline typically includes an alignment step to correct for the effect of motion. Even if we are not aware of it, everyone tends to slightly move their head while in the scanner. For a group analysis (when we try to study brain activations across a group of participants), the pipeline also includes a transformation that puts all the individual brains in a common space (as our brains are all different!). There are many choices that are made along the analysis of fMRI data and two researchers might not necessarily agree on what is the best pipeline for a given dataset. “Reporting” is the action by which researchers share all the details about the pipeline (usually as code) and the data they used. I think that sharing all those details is essential in order to fully understand the generalisability of the findings. 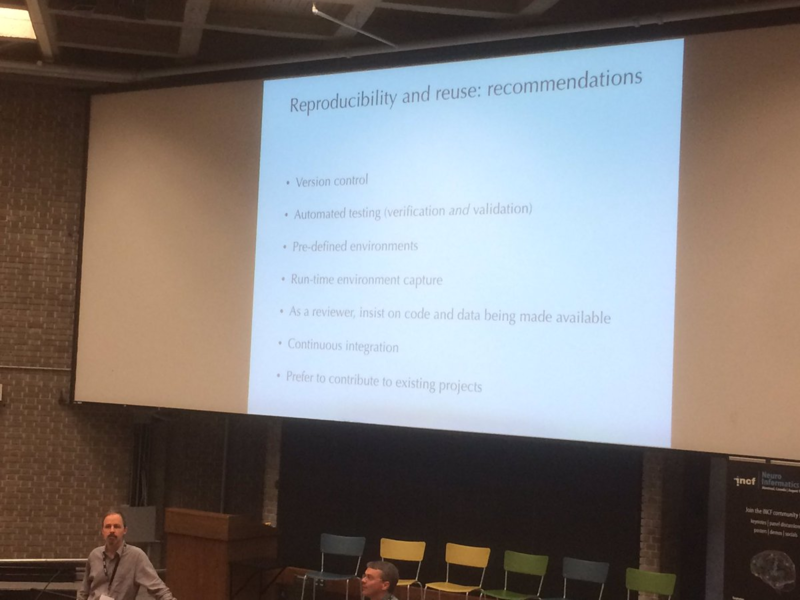 But it is also an excellent opportunity to work more collaboratively and to build stronger results as data and code can be reused by new studies. What are you most proud of accomplishing at #mozsprint? At #mozsprint, I got very nice feedback on how to improve the “vision statement” of the project. Being able to communicate the overall idea of a project in 1 or 2 simple sentences is particularly important but I find writing up those 2 sentences quite challenging! By getting feedback from contributors that were not involved in creation of the project, I had the chance to improve the vision statement much more efficiently. This #mozsprint, I also got the chance to reuse an existing lesson template that was created and shared by Neurohackweek and that derived from a template by the Software Carpentry. After benefiting from those resources to build the first version of the ‘easy fMRI reporting’ website, I was, in turn, able to suggest a couple of edits back to the main project, which is great! Looking back at where you were when you joined the Mozilla Open Leaders cohort, are you where you expected to be? What have you learned in this process? By joining the Mozilla Open Leaders Cohort, I learned that building a community is a lot about make it easy to enter and participate. From creating easy tasks to conveying the goal of the project in a couple of short sentences all those simple steps make a difference! How can others help you continue the work on Easy fMRI Reporting? ‘Easy fMRI reporting’ is looking for all sort of contributions! Please check out the open issues in our GitHub repository. For example, we are currently looking for designers to improve the website and create a logo, for data scientists to provide feedback on their experience sharing code and/or data and for tool developers interested in creating a lesson to showcase their tool. Other ideas? Please get in touch! Yes, I want to thank Demitri Muna for his support and advice throughout this project. I very much enjoyed discussing with him how data sharing is done in the astronomy community! And finally, I would also like to include a link to the Mozilla GitHub repository template that are very useful to start up a new project: https://github.com/acabunoc/mozsprint-repo-template! On February 16th-17th, I went to Sheffield to attend an early career workshop organised by the Information and communication technologies (ICT) theme of the Engineering and Physical Sciences Research Council (EPSRC). 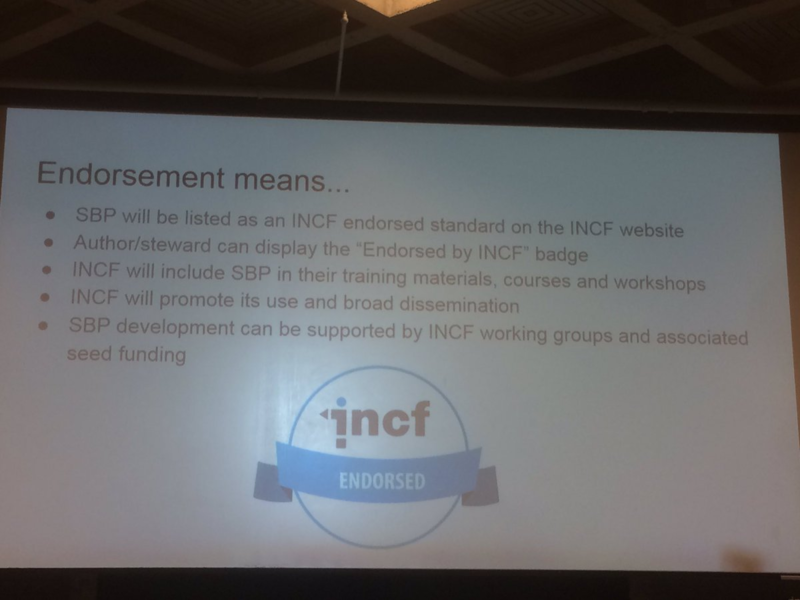 The aim of the workshop was to present the research council strategy and provide guidance for grant applications. During this 1.5 day meeting, time was divided between presentations, discussions and plenty of breaks. This was was a very positive experience, I did appreciate the opportunity to meet with other young researchers and discuss their experience. Some useful links are included below. Balancing capabilities: overview of the research areas covered by EPSRC and how these are planned to evolve in the future. Researchers are encouraged to read the research area rationales. Cross-ICT priorities: A number of theme that are prioritised over all applications. For cross-discilinary work, we can check whether a proposal lies within the remits of EPSRC. EPSRC fellowships are targeted at three career stages: postdoctoral, early career and established career. Only early career and established career fellowships are available for the ICT theme. All fellowships must align with the cross-ICT priority ““People at the Heart of ICT”. 10 tips for academic blogging. I would like to thank my department (WMG) and the Wellcome Trust for their support. More informations: EPSRC Blog post on the event, Slides, ICT theme website, EPSRC website, EPSRC ICT workshop call, #icterc. the patched FSL I was working on. How to create a pip package? In this first post you will find quick references to the commands needed to share your package through Pypi. Pypi, available at https://pypi.python.org, is the official repository for Python packages. Packages available on Pypi can be installed very easily using pip install <package_name>. Create configuration files (including setup.py, setup.cfg) for your project, cf. https://packaging.python.org/distributing/#configuring-your-project for a full list. Upload your package to Pypi! Edited on 06/07/2018: replacing '/pypi' by '/simple' when installing from pypi test.